Series consists of official signed and sealed by-laws passed by City Council, the legislation of the governing body of the City of Vancouver. Series is complete from incorporation in April 1886. Many by-laws include appendices (e.g. financial data, maps, etc.). Arranged chronologically (i.e. in number order). The earliest by-laws were handwritten, as of 1895 they were typed. Although the whole set was originally bound into numbered volumes, by-laws no. 1 through no. 2641 were disassembled for microfilming purposes; subsequent volumes remain bound until 2004. From 2004, all by-laws are disassembled and housed in individual folders. The first accrual was transferred from the Office of the City Clerk in 1974. The following finding aids are available. (1) A file list of by-laws is available and searchable. Search database by by-law title (e.g. "By-law no. 6564", "Heritage by-law", etc.). 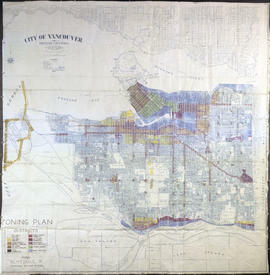 (2) Indexes generated by City Hall and kept current are available as hardcopy in the Archives Reading Room.